These ergonomic drum handlers allow you to move drums on and off pallets, spill containment pallets or drum dollies without the risks of injuries from manhandling. Raise drums with the ease of Power-Lift Options and move drums on and off pallets. Lift, move and pour drum. 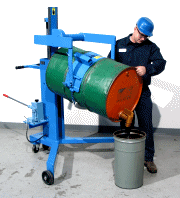 These models utilize a drum holder around drum to lift, transport, rotate and pour drum. Model 82A drum carrier has hand pump for drum lift and manual drum tilt. Power-Lift Options available. Lift and move upright drum. These models have jaws to grip the drum rim and transport drum in upright position. Model 82H drum mover has hand pump drum lift. Power-Lift Options available. These ergonomic and effective drum movers address the risks of manually lifting and lowering drums and moving drums on and off pallets. 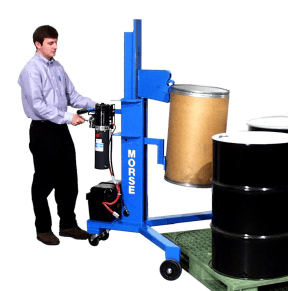 Eliminate manhandling drums with the risks of strained backs, pinched fingers, and other serious injuries. The V-Shaped base of these drum lifters is designed to raise and place a drum at the corner of a pallet. Lift an upright drum 20" high. Models are available with AC, DC or Air power-lift options. Drum Mover - Drum Palletizer. Lift drum with the ease of power-lift options and transport drum to and from pallets. Morse drum movers - drum palletizers.